Thyroid gland, anterior and lateral views. Each lobe is 50-60 mm long, with the superior poles diverging laterally at the level of the oblique lines on the laminae of the thyroid cartilage. (The video below depicts an ultrasonographic view of the right lobe of the thyroid gland.) The lower poles diverge laterally at the level of the fifth tracheal cartilage. Although thyroid weight varies, it averages 25-30 g in adults (it is slightly heavier in women). The gland enlarges during menstruation and pregnancy. Sonogram of a normal right lobe of the thyroid gland. Video courtesy of David L Francis, MD. Principal innervation of the thyroid gland derives from the autonomic nervous system. Parasympathetic fibers come from the vagus nerves, and sympathetic fibers are distributed from the superior, middle, and inferior ganglia of the sympathetic trunk. These small nerves enter the gland along with the blood vessels. Autonomic nervous regulation of the glandular secretion is not clearly understood, but most of the effect is postulated to be on blood vessels, hence the perfusion rates of the glands. Under the middle layer of deep cervical fascia, the thyroid has an inner true capsule, which is thin and adheres closely to the gland. Extensions of this capsule within the substance of the gland form numerous septae, which divide it into lobes and lobules. The lobules are composed of follicles, the structural units of the gland, which consist of a layer of simple epithelium enclosing a colloid-filled cavity (see the image below). Follicles of the thyroid gland, consisting of a layer of simple epithelium enclosing a colloid-filled cavity. 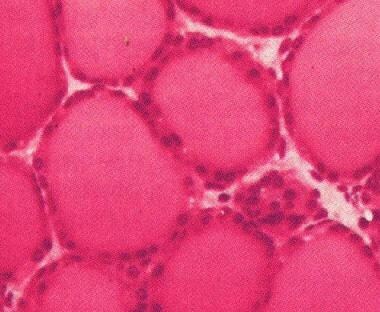 This colloid (pink on hematoxylin and eosin [H&E] stain) contains an iodinated glycoprotein, iodothyroglobulin, a precursor of thyroid hormones. Follicles vary in size, depending upon the degree of distention, and they are surrounded by dense plexuses of fenestrated capillaries, lymphatic vessels, and sympathetic nerves. Epithelial cells are of 2 types: principal cells (ie, follicular) and parafollicular cells (ie, C, clear, light cells). Principal cells are responsible for formation of the colloid (iodothyroglobulin), whereas parafollicular cells produce the hormone calcitonin, a protein central to calcium homeostasis. Parafollicular cells lie adjacent to the follicles within the basal lamina. On its way to the larynx, the recurrent laryngeal nerve usually passes deep to the Berry ligament or between the main ligament and its lateral leaf. Deep to the ligament, but lateral to the nerve, is a posteromedial portion of the thyroid lobe, which may be overlooked during thyroidectomy. The lateral surface of the thyroid is covered by the sternothyroid muscle, and its attachment to the oblique line of the thyroid cartilage prevents the superior pole from extending superiorly under the thyrohyoid muscle. More anteriorly are the sternohyoid and superior belly of the omohyoid muscle, overlapped inferiorly by the anterior border of the sternocleidomastoid muscle. 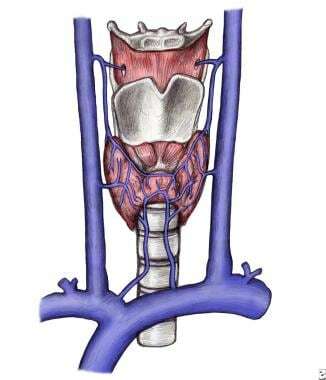 The sternohyoid and sternothyroid muscles are joined in the midline by an avascular fascia that must be incised to retract the strap muscle laterally in order to access the thyroid gland during thyroidectomy. If strap muscles are to be transected for better exposure, do so high in the neck, because the motor nerve supply from the ansa cervicalis enters these muscles inferiorly. Distribution of thyroid arteries with associated laryngeal nerve, anterior view. 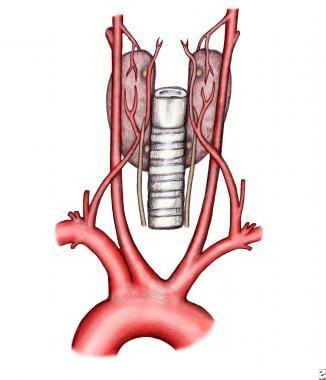 The superior thyroid artery is the first anterior branch of the external carotid artery. In rare cases, it may arise from the common carotid artery just before its bifurcation. 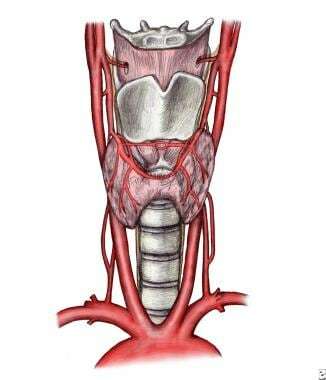 The superior thyroid artery descends laterally to the larynx under the cover of the omohyoid and sternohyoid muscles. The artery runs superficially on the anterior border of the lateral lobe, sending a branch deep into the gland before curving toward the isthmus, where it anastomoses with the contralateral artery. The inferior thyroid artery arises from the thyrocervical trunk, a branch of the subclavian artery. It ascends vertically and then curves medially to enter the tracheoesophageal groove in a plane posterior to the carotid sheath. Most of its branches penetrate the posterior aspect of the lateral lobe, as shown below. Distribution of thyroid arteries with associated laryngeal nerve, posterior view. The inferior thyroid artery has a variable branching pattern and is closely associated with the recurrent laryngeal nerve (seen in the image below). The latter also ascends in the tracheoesophageal groove and enters the larynx between the inferior cornu of the thyroid cartilage and the arch of the cricoid. The recurrent laryngeal nerve can be found after it emerges from the superior thoracic outlet, in a triangle bounded laterally by the common carotid artery, medially by the trachea, and superiorly by the thyroid lobe. The relationship between the nerve and the inferior thyroid artery is highly variable, as demonstrated by the classic work of Reed, who in 1943 described 28 variations in this relationship. The nerve can be found deep to the inferior thyroid artery (40%), superficially (20%), or between branches of the artery (35%). Significantly, the relationship between nerve and artery on one side of the neck is similar to that found on the other side in only 17% of the population. Furthermore, at the level of the inferior thyroid artery, branches of the recurrent laryngeal nerve that are extralaryngeal may be present (5%). Preservation of all of those branches is important during thyroidectomy. Another hint to the location of the recurrent laryngeal nerve is the Zuckerkandl tubercle, an extension of the thyroid, which is close to the Berry ligament. On rare occasions, the recurrent laryngeal nerve may pass directly from the vagus to the larynx, close to the superior thyroid vessels. This formation is nearly always observed on the right side and is associated with a retroesophageal subclavian artery. However, the formation can occur on the left side in cases of transposition of the great vessels. Three pairs of veins provide venous drainage for the thyroid gland (see the image below). The superior thyroid vein ascends along the superior thyroid artery and becomes a tributary of the internal jugular vein. The middle thyroid vein follows a direct course laterally to the internal jugular vein. The inferior thyroid veins follow different paths on each side. The right passes anterior to the innominate artery to the right brachiocephalic vein or anterior to the trachea to the left brachiocephalic vein. On the left side, drainage is to the left brachiocephalic vein. Occasionally, both inferior veins form a common trunk called the thyroid ima vein, which empties into the left brachiocephalic vein. Lymphatic drainage of the thyroid gland is extensive and flows multidirectionally. Immediate lymphatic drainage courses to the periglandular nodes; to the prelaryngeal (Delphian), pretracheal, and paratracheal nodes along the recurrent laryngeal nerve; and then to mediastinal lymph nodes. Regional metastases of thyroid carcinoma can also be found laterally, higher in the neck along the internal jugular vein. This can be explained by tumor invasion of the pretracheal and paratracheal nodes causing an obstruction of normal lymph flow. Cummings CW, et al. Thyroid anatomy. Cummings CW, ed. Otolaryngology - Head and Neck Surgery. 3rd ed. St. Louis, Mo: Mosby; 1998. 2445-49. 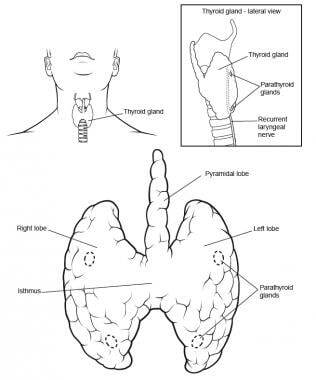 Thyroid gland. Williams PL, Bannister LH, et al. Gray's Anatomy. 38th ed. New York, NY: Churchill Livingstone; 1995. 1891-6. Naidoo D, Boon JM, Mieny CJ, et al. Relation of the external branch of the superior laryngeal nerve to the superior pole of the thyroid gland: an anatomical study. Clin Anat. 2007 Jul. 20(5):516-20. [Medline]. Reed AF. Relations of inferior laryngeal nerve to inferior thyroid artery. Anatomical Record. 1943. 85:17. Gravante G, Delogu D, Rizzello A, et al. The Zuckerkandl tubercle. Am J Surg. 2007 Apr. 193(4):484-5. [Medline]. The authors and editors of Medscape Reference gratefully acknowledge the contributions of previous author David Lemaire, MD, to the development and writing of this article and the contributions of David L Francis, MD, to the multimedia video.